The next step is to prepare the Active Directory forest to support an Exchange organization. Although this process does not make as many changes to the forest, it does make quite a few more noticeable changes, such as creating the various Exchange configuration containers and creating Exchange security groups. 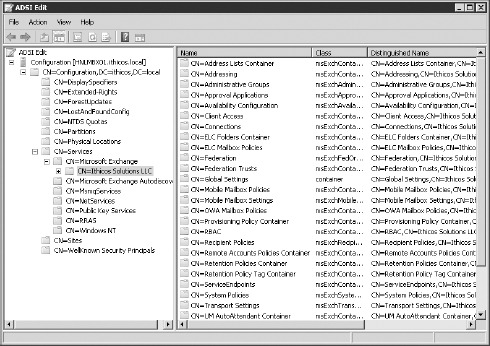 An example of the configuration containers that are created is shown in Figure 2. To run the forest preparation, you must be logged on with a user who is a member of the Enterprise Admins group. Further, you should run the forest preparation process from a server that is in the same Active Directory site and domain that holds the schema master flexible single master of operations (FSMO) role. The setup /PrepareAD option is used to prepare the Active Directory. In previous versions of Exchange Server, choosing the right organization name was often a source of great anxiety. With Exchange 5.5 and earlier, when you built an Exchange site, if you did not pick the right organization name, you could not replicate that site's global address list to the rest of the organization. Even with Exchange 2000/2003, the organization name was visible at the top of the global address list and within the Exchange System Manager administrative console. And once the organization name is set, it cannot be changed. Fears of acquisitions, mergers, and company name changes still drive people to be concerned about this name. Although we still recommend naming your organization something descriptive, the actual name is not as important because it is not going to be seen by the end users and is rarely (if ever) seen by the administrators. You can always set the organization name to something generic like ExchangeOrganization if you want something that would not be affected by a reorganization. When the /PrepareAD process runs, it will check to see if the /PrepareLegacyExchangePermissions or /PrepareSchema steps need to be run. If so, Setup will check to see if you have the necessary permissions to run them, and Setup will run these steps as well. However, if the other steps are necessary and you do not have the necessary permissions, you will see an error and Setup will fail. If you have only a single domain in your Active Directory forest, the Setup option /PrepareAD will prepare that domain and you will be ready to proceed with your first Exchange server installation. Assigning to the domain container various permissions to the Authenticated Users and Exchange universal security groups that are necessary for viewing recipient information and performing recipient management tasks. Creating a Microsoft Exchange System Objects container in the root of the domain; this container holds mail-enabled recipient information for organization objects such as Exchange databases.